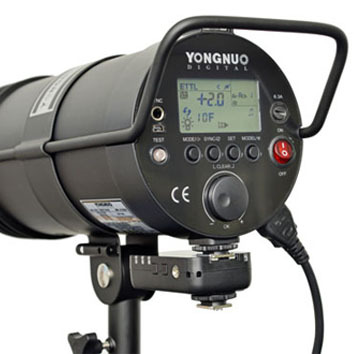 You can now order the Yongnuo YN300W, a mains-powered studio flash with E-TTL support. 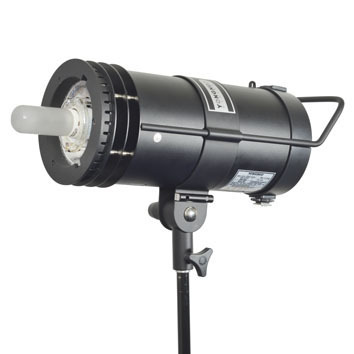 You can now order the Yongnuo YN300W, a mains-powered studio flash with E-TTL support. The 300Ws unit is Yongnuo’s first monobloc, featuring a hotshoe foot that lets you trigger it like a speedlight. It is priced just under $500, which might be a bit steep for aspiring early adopters, but you won’t find a hotshoe-mount studio flash like this anywhere else. By attaching a YN622 (or a receiver from the TTL radio system of your choice) the YN300W becomes a wireless TTL head. If radio signals aren’t your thing you could even use a 10m TTL cord and have a hugely-powerful (though not very portable) wired lighting system. The merits of having a mains-powered light with automatic exposure metering are entirely clear, as most studio lights live in controlled environments where TTL is unnecessary. Unlike the Profoto B1 or CononMark K4T, the Yongnuo YN300W does not have an internal battery pack and runs on AC power. It’s also not restricted to any particular brand of triggering system (despite Yongnuo building radio into many of their speedlites) because you bring your own radio rather than relying on one that’s built-in. ThePhotoGadget has listed the YN300W for US$488.99, for which you get the flash itself, a power cable and a standard Bowens-mount reflector. We haven’t seen the system pop up at Yongnuo’s official eBay store yet but it is available from other sellers. For more technical information, read our earlier announcement article. Is there any point in a TTL flash you can’t carry with you? Does TTL have a place in the studio? Let us know what you think by leaving a comment below.